All of HD Merrimack's products – Emergency Medical Info Kits, Medical Management Tools, Easy Minder Reusable Lists and Celebrating Life Bookmarks - help organize and simplify everyday life. Our Emergency Medical Info Kits keep critical medical information in one place and if 911 is called, helps EMS provide safer, more accurate treatment. 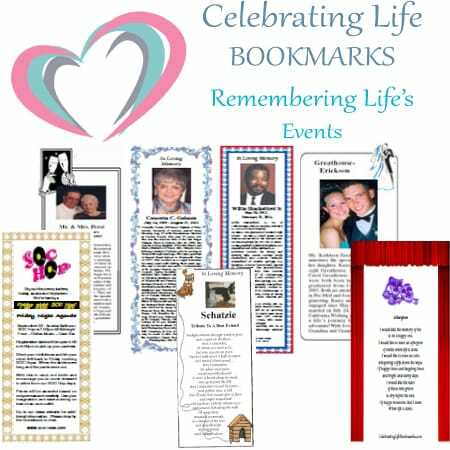 Celebrating Life Bookmarks help people Create a heart-warming and lasting keepsake honoring the special people and events in your life. Our memorial bookmarks bring solace and healing energy while our celebration bookmarks bring joy and remembrance to those special occasions. Take the worry out of an unexpected emergency by being prepared with our Emergency Medical Info Kits which provide critical information in an easily retrievable format. First responders can quickly provide more accurate treatment. Our medication management tools help you with medication compliance, Weekly Medication Charts, and disease management. Notice trending & adjust medication dosages with our Glucose & Blood Pressure logs. Celebrating Life Bookmarks honor your loved ones and the special occasions in their lives. Our custom designed Memorial Bookmarks and Celebration Bookmarks allow you to create a bookmark that helps remind you of the joy that a special person or occasion brought to your life. We also have developed a donation generating program for hospices using the Celebrating Life Bookmarks. HD Merrimack is proud to be a socially and environmentally conscious business that makes a difference on many levels. All our products are made here in New England. We are also a WBENC (Women Business Enterprise National Council) certified business.